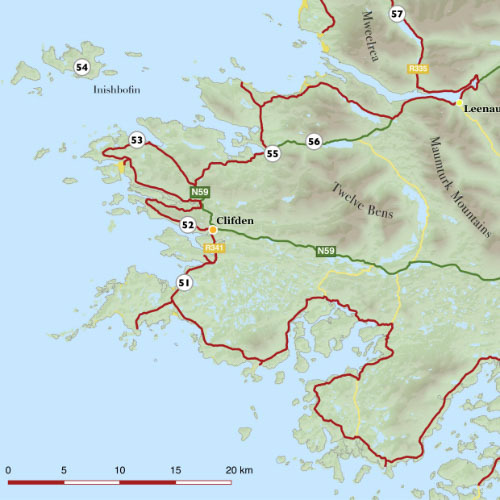 Ensure that you don’t miss a thing with this comprehensive Wild Atlantic Way Guidebook! Boasting ancient tombs, atmospheric castles and sacred retreats, the Wild Atlantic Way is absolutely packed with treasures to discover. 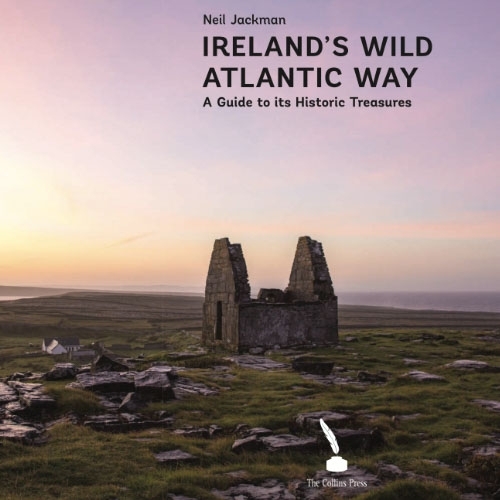 With 100 of Neil Jackman’s favourite sites from Kinsale in West Cork to Malin Head in County Donegal, this guidebook will help you to embark upon a true explorer’s odyssey! You will discover the stories behind the stunning scenery. See 350 million year old footprints on Valentia Island, experience the idyllic Connemara retreat of revolutionary Patrick Pearse, and get off the beaten track as you climb up to an ancient fortress atop a Kerry mountain. Best of Summer Non-Fiction, Irish Independent. You will find all the iconic sites like the Cliffs of Moher, Gallarus Oratory, Bantry House and Dún Aonghasa, alongside hidden gems such as Dunlough Castle, Fallmore Church and the Doonfeeny Standing Stone. 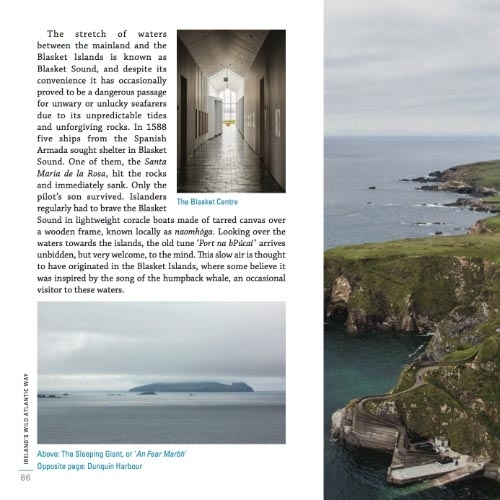 It will help you to discover the delicate natural heritage of Ireland’s western coast at Connemara National Park and Ballycroy National Park, and we will even voyage to the wonderful islands of Ireland, like Clare Island, Inishmurray, Inishbofin, Scattery Island and of course the iconic Skellig Michael. The sites are numbered from north–south, beginning with Site 1: Kinsale, and ending at Site 100: Malin Head. 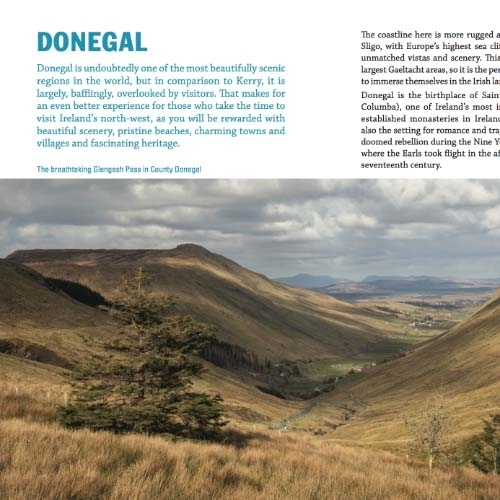 Counties Cork, Kerry, Limerick, Clare, Galway, Sligo and Donegal are all featured. 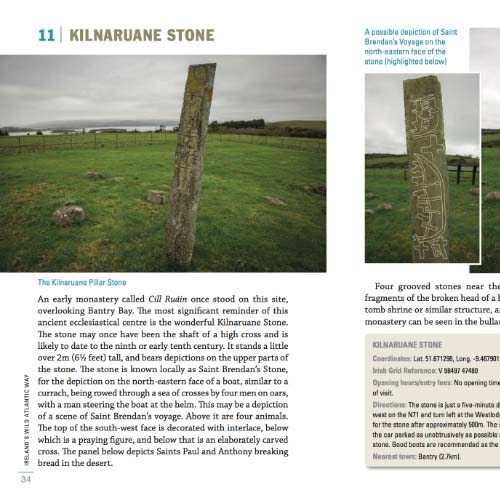 Along with information about the archaeology, history, folklore and landscape, each site entry comes with all the practical information such as directions, co-ordinates, grid references and opening times. The book also has a series of detailed, clear and easy-to-use maps at the back to help you navigate the route, along with a glossary. This engaging and practical guidebook is an essential companion for any explorer who wishes to dig deeper to discover the gems of this truly spectacular landscape! “In all, it is a colourful, compact and accessible book that belongs in any backpack or pocket heading to the west coast. Archaeology Ireland, Vol.32 No.2, Summer 2018. The guidebook is available in all good bookshops across Ireland from March 19th, but we have a limited number of signed copies available now. You can also order an unsigned copy online from the Collins Press, Book Depository, Easons or Amazon (but if you have the opportunity please do consider supporting a local bookshop or library). Neil Jackman is an experienced archaeologist and the director of Abarta Heritage. 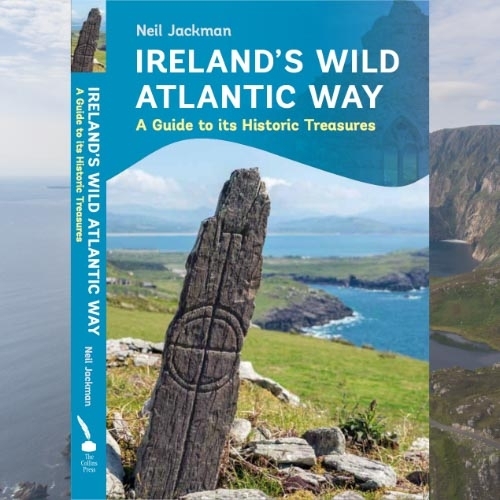 This Wild Atlantic Way guidebook is the second publication in this series for Collins Press, along with the acclaimed guidebook to Ireland’s Ancient East. This book is wonderful if you are planning on traveling the Wild Atlantic Way and even if you just like to read about places in Ireland. The photos are fantastic. I used this book alone to plan my trip this year. It was all I needed. It was a most pleasant trip having the information about each place we visited. I would recommend this book along with Ireland’s Ancient East to all who have an interest in Ireland.